Jim (@jcollison), Andrew (@unrealshots) and Christian (@theWizBM) are joined this week by Bill Paulmenn (@BillPaulmenn) and Renny Phipps (@rennyphipps) for show 102! 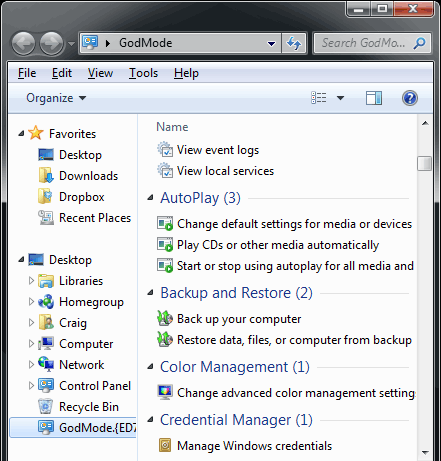 The guys start off the show hearing about Renny’s recent trip to the USA, before moving on to Renny telling us about the “God Mode” within Windows 7, which is a Windows 7 Easter Egg that allows you to create a folder containing all of the Control Panel shortcuts in one folder. Renny also talks about this 2013 goal of tidying up his Home Technology, assessing the hardware and applications he has, and performing a bit of a Spring Clean. The guys talk a about recycling options for disposing of old computer hardware, with options like Best Buy in the USA, Officeworks in Australia, local council clearances, or archiving old hardware in the home. For those of us who use multiple cloud storage providers, the guys talk about the ideal service to enable synchronization of data between providers without having to download and upload the data. For the die hard tech buff’s, the Consumer Electronics Show (CES) has just finished in Las Vegas – the show was comprehensively covered by Jim and Dave McCabe from the Home Server Show, and the guys talk about the highlights for them, from the various vendors who were at the show. Christian talks about the recent changes to Skype, which now allow full contact integration into Outlook – yet another step in Skype becoming the replacement for Windows Live Messenger, which is being retired by Microsoft. Christian also discusses the current top selling laptop from Amazon – the Google Chromebook. Andrew talks about introducing a new TP-Link WR1043ND router into his home network, to enable a single wireless SSID to be accessible throughout the home, as his cable modem does not have sufficient range to be able to cover the whole house. An affordable performance and coverage improvement. Jim and Bill talk about wireless security cameras available from vendors such as DLink, as well as talking about WiFi available from vendors such as AT&T and Comcast “in the wild”. Jim tells us about a Twitter stats site, TWTRLAND, a website into which you enter your Twitter name, and it will provide you with statistics as to how you use Twitter, including who you interact with, and things on Twitter that might interest you. To close out, Jim talks about a “crowd storage” solution, Symform, which gives you cloud storage by contributing storage to the “crowd storage” pool.